If you are considering installing your own cabinets and the area has concrete walls, there are a few things you need to know how to do correctly. There are special tools that make hanging wall cabinets on concrete an easier task. Particular fasteners will make the cabinet installation on concrete go smoother as well. I had a cupboard installer that worked for my company who used to use the regular #2 cabinet installation screws for hanging the boxes on the walls. He would use an eight inch wide concrete drill bit to pre-drill the holes for the screws to go into. 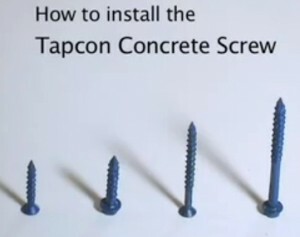 The way that I personally like to attach cabinets to concrete walls is by using Tapcon screws. The anchors work great for fastening cupboards to the wall. The Tapcon masonry screws can be purchased with the exact sized drill bit that is needed for pre-drilling for the wall anchor. Tip: If you are hanging your cupboards on a block wall, but there is drywall over the surface, the chances are really good that there are furring strips behind the drywall. If this is the case you will not need to attach the cabinets by screwing into the block. You can locate the one inch by two inch furring strips and secure the cabinetry with regular wood screws. Just make sure that the screws you are using are not too long. I would highly recommend using a hammer drill when you are installing cabinets on masonry block walls. It’s just too much work trying to drill a pilot hole for the cement fasteners with a regular electric drill. I tried using a regular drill once and I burnt the tips off of about two or three masonry drill bits. Hammer drills are not cheap. If you can borrow one from a friend that is what you should do, unless you plan on using it in the future. 1)	Pre-drill the installation holes in the back of the cabinet that will secure them to the block walls. This should be done with a three sixteenths inch wide drill bit. 2)	Set the cabinet in its exact position that it will be permanently installed in. If it is an upper cabinet you can use prop sticks to hold the cabinet up. Some people even screw a two-by-four stud, in a level position, to the wall to rest the upper wall cabinet on. A second person helping is suggested for safety purposes. 3)	Using the three sixteenths inch holes in the back of the cupboards, as a guide, drill the holes in the concrete wall using the hammer drill and the correct sized drill bit for the Tapcon cabinet fasteners. 4)	Sometimes I just start a small pilot hole with the hammer drill, take the cabinet down, drill the hole completely and then put the cabinet back into place and secure it to the masonry wall with the Tapcons. Tip: If the inside of the cabinets are white, I recently saw Tapcon screws in a white color that could be used for securing them to the walls. The screws are generally available in blue without any problem. I have painted the heads of the screws on certain occasions to make them match the interior of the cabinetry. The main thing about installing cupboards on block, masonry or concrete walls is that you should never over tighten the screws. If you feel one slip out when you are screwing it into place, drill another hole and start over. I also am not shy when it comes to using plenty of screws, especially when I am securing upper-wall cabinets.